This Neo Classic sailing yacht has a simple deck with most of the maneuver halyard hidden beneath and driven to the aft part of the cockpit. The carbon rig is a swept back 3 spreader layout with 110% jib overlap and no runners. Construction is 100% carbon and epoxy perfectly executed to achieve and extraordinary strength hull with a very light displacement. The keel is made of a high tensile steel plate with a heavy bulb for a very low center of gravity within a reasonable draft. The Edwardian style interior was executed in Teak, Caoba and Cedar woods with a classical arrangement: owner’s cabin forward, salon amid ship connected with the galley and the 2 guest cabins astern. She is a RINA CE A1 certified vessel and all the extensive maintenance, upgrades and updates made since her launch has been approved by the architect and the builder. This unique sailing yacht is ready to please the most discerning yachtsman. United Yacht Sales New Jersey would love to guide you through a personal showing of this 74' King Marine Aft Cockpit Performance Sloop 2004. 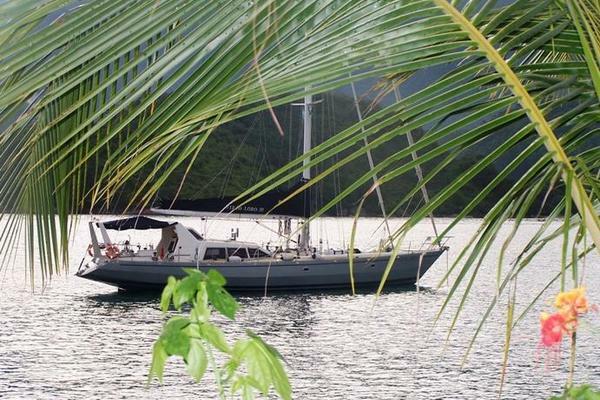 This yacht for sale is located in Unknown Panama and priced at $1,350,000. For a showing please contact us by filling out the form on this page and we will get back to you shortly! When the Owner of this unique sloop envisioned a retro look sailing yacht capable of the most exhilarating performances he hired the best duo of the modern times to meet his expectations: the naval architect, Javier Soto Acebal and the Spanish shipyard King Marine are known by the creation of many iconic vessels and they did it again with this yacht, combining a minimalist outside look, reminiscent of the 1900-1930 sailing boats, with state-of-the-art project and construction aiming for a very aggressive performance. this Neo Classic sailing yacht has a simple deck with most of the maneuver halyard hidden beneath and driven to the aft part of the cockpit. The carbon rig is a swept back 3 spreader layout with 110% jib overlap and no runners. Construction is 100% carbon and epoxy perfectly executed to achieve and extraordinary strength hull with a very light displacement. The keel is made of a high tensile steel plate with a heavy bulb for a very low center of gravity within a reasonable draft. The Edwardian style interior was executed in teak, Caoba and Cedar woods with a classical arrangement:Owner's cabin forward, salon amid ship connected with the galley and the 2 guest cabins astern.Don Juan is a RINA CE A1 certified vessel and all the extensive maintenance, upgrades and updates (listed below made since her launch has been approved by the architect and the builder. The interior bulkheads, doors, cabinets and decks are constructed in a Kevlar/honeycomb sandwich and finished with Caoba, Cedar and teak woods. Owner's cabin on forward provided with air conditioner unit, LCD TV and CS Player, a centered salon connected with the galley and an access to the guest cabins on aft. the salon includes a complete entertainment center (LCD TV, Blue Ray disc player and high fidelity sound equipment). In the Salon, this disposition includes the settees and table with will accommodate up to eight persons. The yacht has three heads (one in each cabin). the condition of the accommodations throughout the entire vessel and all other internal spaces are well maintained.The galley comes with two stainless steel sinks with hot and cold water pressure system and a force 10 gimbaled stove with three burners and oven. A reefer box, fridge, and microwave complete the galley utilities. there are two tanks for fresh water and the yacht does have a water maker installed. The sloop rig is comprised by a stepped carbon fiber mast with 3 spreaders and a carbon fiber boom both made by King Marine. A Harken hydraulic roller furler serves the jib and the genoa. Vang is a Navtec hydraulic. Sails made by UK are:carbon-aramid main, carbon-aramid tape drive main, carbon-aramid genoa, dacron forestay and a laminated Code Zero. The vessel is equipped with one Delta anchor, one Fortress anchor and one small CQR anchor. The yacht carries adequate quantities of chain and ropes. The engine room is located aft of mid-ships (salon area) with an easy access from both guest cabins. the vessel is powered by a Yanmar diesel engine of 240 HP served by a 250 gallons diesel tank.The battery system consists of 16 units, 24 volt, for service and domestic use. the steering system is hydraulic and it is provided with automatic pilot. There are eight individual electric bilge pumps on board. There are four Mastervolt battery chargers and Mastervolt power inverter installed. The rudder and its shaft are constructed of carbon fiber. The propeller is an 18 inch Variprop, with a 1.25 inches stainless steel shaft, and standard seal configuration. An electric hydraulic bow thruster has been installed on forward. Two life rafts, which capacities are for 6 and 10 people. Package of pyrotechnics: Hand flares, smoke flares, etc.